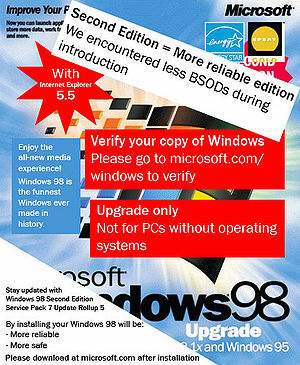 Windows 98 Box Cover - Deprove your PC! Windows 98, functioning at standard level for people in wheelchairs with disabilities . A working successor to Windows 95, which never was released, since its development was based on the false assumption that electricity actually works. Windows 98 was created on a typewriter by Bill Gates' mum, it was a minor revision of Windows 95. And if you don't believe, you are a MORON. It is powered by the powerful and freakishly large forehead of Keifer Sutherland and the 7 spices boot loader. 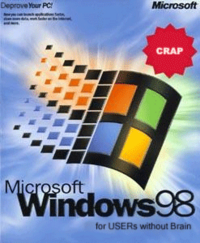 The recently developed motto at the time for Windows 98 was its major theme tune, "If it doesn't crash frequently, something is seriously wrong." Now for the Nintendo 64. 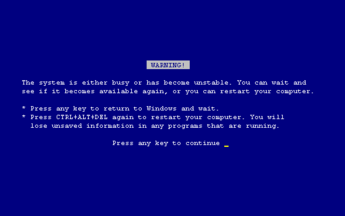 Windows 98 is best known for the easter egg known as the Blue Screen of Death (BSOD). The direct predecessors to Windows 98, Windows 96, was shipped in 1997 but was unusable because, as Microsoft soon learned, the standard keyboard does not contain the "Spling" button, the most important one. On the day it came out, admissions to hospitals increased 3-fold. After learning this, they developed Windows 97, only to learn that there was no "Globlaq" button either. So, they used CTRL, ALT, DELETE, and the Windows logo in their place and then immediately after pushing those buttons a female stripper would appear out of nowhere to help fix the blue screen of death! A patch had to be released to support all other keyboard buttons. 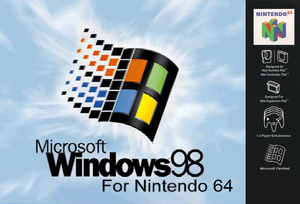 In late 1998, Bill Gates revealed that Windows 98 was actually an April fools joke and that Windows 99 was coming, although the general public took Windows 98 seriously, since they could now effectively separate their Asian pron from their child pron using the new "folders" feature. Following the cancellation of Windows 99 and the failure of Windows 2000, Windows 98 was effectively obsoleted by Windows π (Windows 3.1), which was developed in 1984 by George Orwell. Go figure. Soon later Microsoft released the second edition, with a really simple and easy-to-read cover. The problem that the intended target platform for Windows 98 grandmothers who often asked "Does my IBM have enough space for the Internet?" were just plain too stupid to use a computer. Then Microsoft marketed to 1337-HaXXors, but they nit-picked every part of the OS. Bill Gates was so angry that he ran into Microsoft headquarters and barbecued half of his staff with a flamethrower. The signature start-up screen for all editions of Windows 98. The L337 5UP4 H4X0Rs at KissMyFloppy came to acquire the sauce code for Windows 98. The leaked sauce made the news after a developer placed a leaking sauce packet on top of mainframe whilst he sat down to eat his burger. The sauce destroyed all of Microsoft's original files, which is why support for previously sold versions was quickly dropped. Fortunately, one of the developers managed to find the Windows 98 listing on some pieces of recycled paper that were in one of the toilet cubicles. Please note this code above is from the 1st edition. The second edition sauce code is nearly identical to the one above, but with added Plug-and-Play support for 5.25" floppy disk drives.